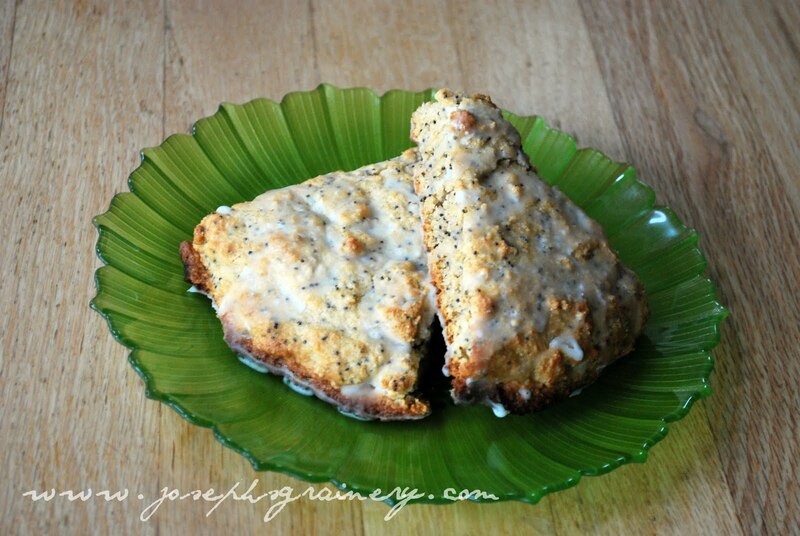 MaMa says all you need to add to these Lemon Poppyseed Scones is a nice hot cup of coffee (or tea). She says they are perfect for when you have a friend over for coffee and to catch up. I personally just like the sugary lemon drizzle that's on them. I could just lick it right off. We saw this recipe on Cinnamon Spice & Everything Nice and new we had to try it, with a few alterations. Directions: Preheat oven to 400 degrees F. Combine flour, sugar, poppy seeds, lemon zest, baking powder, baking soda, and salt in a large mixing bowl. Use a pastry cutter or two knives scissor fashion to cut in butter until it resembles coarse meal. Add the buttermilk and 1/4 cup of lemon juice, stirring until a dough starts to form. Press dough together and form a ball, transfer to a parchment-lined baking sheet and shape into an 8-inch disk. Our dough was too liquidy at this point to cut into wedges and separate, so we baked the whole disk until golden and a toothpick inserted into center comes out clean, about 10 minutes. Then we cut the disc into 8 wedges, spread them about an inch apart and baked for another 2-3 minutes to crips up the edges. Cool on wire racks. Whisk confectioners' sugar with a tablespoon of lemon juice until smooth. Drizzle over scones and sprinkle with poppy seeds.